Sarah Siddons was a renowned tragic actress of the 18th century. She was born on 5th July 1755, in a room above a small tavern in High Street in Brecon (Brecknockshire, Wales) into a theatrical family. Her father was Roger Kemble, the manager of the touring theatre company the Warwickshire Company of Comedians, and her mother was the actress Sarah Ward, daughter of the comedian John Ward. Five of their children (they had 12 in total; Sarah was the oldest) and several grandchildren all became famous actors. Sarah was the most famous of them all. Acting was in her blood and, from an early age, she appeared on the stage in her father’s shows. Sarah bloomed into a beautiful young woman and, at 15, caught the eye of a member of her father’s troop, a certain William Siddons. Her parents weren’t happy at this match and decided to take Sarah off the stage and send her to work as a lady’s-maid to Lady Greathead, of Guy’s Cliff (near Warwick) for £10 a year, hoping the couple would fall out of love. Two years passed before her parents realised how deeply her daughter and William cared about each other and finally consented to their union. In 1773, the couple tied the knot. They had seven children, but only two of them survived childhood, and the marriage eventually ended in a formal separation. Acting was an important part of their lives and marriage. It was while she was on the stage with her husband that she was noticed by David Garrick, which resulted in her being engaged to act at the Drury Lane theatre. However, her fist appearance as Portia in the Merchant of Venice wasn’t successful and she was fired. For the next six years, Sarah toured the country, appearing in provincial theatrical provinces. It was at this time that she acquired her reputation as the Queen Of Tragedy. When she returned to Drury Lane in 1782 in the role of Isabella in the The Fatal Marriage, she got a very different reaction. This time she was a huge, and instant, success. But her most famous role was that of Lady Machbeth. 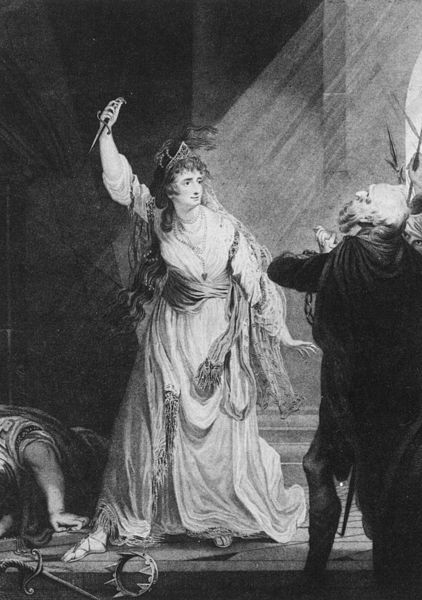 She made it her own, perfectly portraying Lady Macbeth’s vicious passions and character. But her personal favourite role, the one she most enjoyed to play, was Queen Catherine in Henry VIII. She had become one of the most famous actress of her time, and just when acting was becoming a respectable job for a woman. 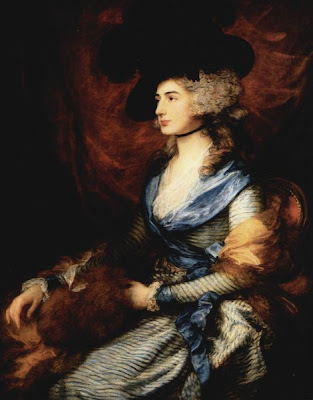 She had her portrait taken by the most renowed artists of the time such as Reynolds, Gainsborough and Lawrence and mixed in social circles with the rich and famous of her age, such as Edmund Burke, Samuel Johnson and the Duke of Wellington. In 1802, she left Drury Lane for Covent Garden, on whose stage she appeared on and off for 10 years. But on 29 June 1812, aged 57, Sarah retired. The public was said to be so moved during her last performance (she was playing Lady Macbeth) that they refused to let the play go on after the sleepwalking scene, where her character makes her final appearance. The curtain had to be closed and, when it reopened, Sarah was sitting in the middle of the stage, dressed in her own clothes, and addressed an emotional farewell speech to the crowd. It lasted almost 10 minutes. However, that wasn’t her final appearance. Over the next few years, she sometimes appeared on the stage again. Her real final appearance was in the role of Lady Randolph in John Home’s Douglas on 9 June 1819. 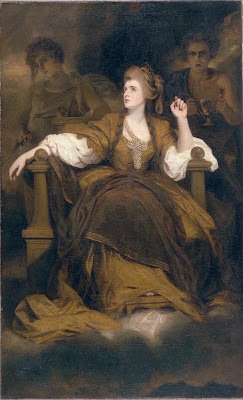 Sarah Siddons died on 8 June 1831 in London and was interred at St Mary’s Cemetery in Paddington. Over 5,000 people attended her funeral to pay their tribute to one of Britain’s greatest actresses.